Looks like more slippage in the schedule. Ended up destroying the seal in the HTOB and since those are very unique and proprietary a google search on the seal number drew a blank. SOo.... another $48 and a 3-7 day wait for another HTOB. That doesn't leave enough time for install and shakedown/tuning so the roadster will stay home this time. I'll bring it to Townsend instead. Too bad, I know a few were looking forward to the tech session. Guess we'll do Roadmaster A/C instead. Sorry to hear that, Jim. I know it has been a long time. For such a high priced product, most HTOB's are overpriced, underperforming pieces of crap. An HTOB stopped me from going to British V8 2002 in Tennessee, so I can sense your disappointment - do yourself a favour and ditch the thing and go to an external slave cylinder. Roadmaster will be more than suitable alternative. Jim - is there not time to make a bracket & use an external slave? Don't have to pull the engine for that. Cutting the fixed crossmember and fashioning a removable section becomes mandatory unless the engine is removed also. Unless either the engine is positioned very far forwards or the engine mounts etc allow the engine to be greatly tilted to the rear, it is not removable due to the firewall. In most cases this will also mean unbolting the headers from the heads for transmission removal, and possibly unbolting the engine mounts. It may mean jacking up the front of the engine as well. Access to the bellhousing/engine bolts is very difficult. In addition, it requires careful selection of the pressure plate as it is incompatible with a high RPM bent finger diaphragm style PP. To get the same performance, a finger-weighted style such as CenterForce must be used, adding additional expense. Then as Graham notes there is the quality. Upon removal of the seal I was able to inspect the bore and the shortcomings there are obvious. No deburring was done on the holes that lead to the bore for pressure and bleed, resulting in some very sharp edges in proximity to the seal. It looks rather clear that every time the seal bottomed in the bore these edges took a nibble out of the back outer edge of the seal, any one of which could have caused leakage. And finally there is the fact that you cannot use this HTOB without an $80 input shaft bearing retainer which is difficult to source. Unless that is already on the transmission it is an additional expense. Now to be fair, the alternatives are not perfect. Aftermarket HTOBs also do not allow the use of a bent finger PP. They have had quality issues. They generally have no anti-rotation provision aside from the hoses. And they are ridiculously expensive. A mechanical TOB has friction, clearance, linkage and slave issues, but it will allow the use of the bent finger PP if room can be found externally. Usually this means a "pull" type cylinder, shortening of the clutch arm, and juggling of bore sizes to get something that works and feels acceptable. However, I'm willing to consider that possibility. A cable release arm such as used in the V6 Buick application would allow a rear mounted standard cylinder. So I got insurance on the car today and went for a couple of short drives down the street. Still have start-up and warm-up tuning to do and there's a squeak I need to find, but initial results are promising. It's got a lot of power and sounds awesome, the blower is putting out about 5psi which is what I was expecting. I'll try to shoot a video next time I have family in town, probably the weekend of the Dayton meet. By then hopefully I'll have most of the shake-down done. I haven't given up on the 8 speed, I recently learned that the TCM used in the 2014 and 2015 Cadillac CTS line might do the trick. Provided I can acquire a pin-out for the TCM connector and perhaps a schematic of the wiring for it. Not the easiest task. In the meantime the T5 will do nicely. I ended up using a S10 clutch fork and Isuzu slave cylinder and think it went together pretty good, not perfect but well enough. Take that thing out and scare the crap out of the cameraman in the right seat. Hopefully, he/she will keep the video going so we can see it in action. I can probably get the pin out and schematics for you. Due to copy right restrictions, most likely I will have to print them out and snail mail them to you though. Jim, Congrats! Take it easy starting out with the low gear first in that T5. You can probably start out in second. ... or 3rd. Or 4th. Starting to drive it around a bit. Not happy with off-idle, I think I need to change the linkage geometry to get more movement initially rather than less, the way it is now. Feels sluggish but it really isn't, just not getting as much gas as the foot thinks it is. Guessed wrong there. It should be pretty easy to change. Mid throttle it has a lot of power. Also I think my off-idle tune needs some work. Interestingly enough, with the 3.54 gears and the 25.7" tall tires, 1st gear is usable. Then around half throttle in 2nd breaks the tires loose. So I have some work to do with that. In time I hope to have something I will enjoy driving but it may be awhile before I get there. Not quite like I can just pick right up where I left off with the 215. But the raw material is there, now I just have to refine it. There are a number of quibbles. Can't swear it'll be ready for Dayton but perhaps, and Townsend should be very possible. Hey Jim, you drove your car to a recent event, right? How'd it feel to have it back on the road? Today I re-torqued the heads to 75 ft/lbs (It has studs and an iron block), and did some work on the belt idler pulleys. They didn't track quite right so I cut the side flanges off and cut a little bit of a crown in them. Looks like that did the trick, too bad I didn't think of it sooner, the belts are about $80 apeace. I've been working on the tune and now have the hot idle down to 1100 rpm which sounds pretty reasonable, at least for now. The engine will recover from dips down to as little as 300-400rpm so I think it should be able to idle lower but I'm fighting a low speed oscillation. I think I've done about as much as I can with the timing and mixture but who knows? Best to start driving it I think. I had to disable my hydraulics on the wing for the time being. It seems I have fluid crossing over so either I have a bad piston seal somewhere or a leak between the reservoirs. More testing required. I locked the wing so I can drive it. I think I'll wait to start it again until I have the sealant added. "capped them both with 14psi pressure caps, making system pressure 28psi"
I meant to revisit this, Curtis, cause I didn't follow that either. I wouldn't think Dalton's Law applies in Jim's situation. The two caps are in series so the pressure adds. The first surge tank overflow is after the pressure cap which holds 14psi. The second, the coolant recovery bottle also has a 14 psi pressure cap which adds to system pressure. So the total is 28psi. Dlaton's law notwithstanding. The last week I've been swapping transmissions. Removed the non-wc T5 and installed a Tremec TKO-425. OK that's probably not the right number but it is the torque rating. It was the predecessor to the TKO-500. Larger input shaft with 26 splines, larger output shaft with 31 splines, derived from a Ford version but built to fit GM applications. There were a few significant differences. First of course was the need for a larger slip yoke and a larger clutch disc. Which also meant a conversion u-joint to match my driveshaft. Overall length was about 1/2" shorter so that was fine. The speedometer drive required a special adapter which I then had to modify further to match my Jaguar speedometer sender unit but I much prefer the new angle of the speedo drive which is pointed more downwards making it easier to fit in the tunnel. The fit into the bellhousing was tighter than I would have liked, and the shifter came out a bit forwards and to the right, requiring some light trimming and a new cover plate. The shifter itself attaches with 2 bolts and the stub sticks up above the tunnel about a half inch. I did not have to touch the transmission tunnel and have probably a half inch of clearance under the seam which is as original. The crossmember did not quite line up and the forward edge had to be trimmed and reinforced. Another inch of setback would have helped there and my engine position is farther forward than most. It has a 3.27 1st gear and 0.68 OD I believe. I won't get to drive it for a few days more though as I'm finishing up the shifter and I have the car on the lift cutting the passenger's side rocker in an attempt to straighten out the bend in the body. But it should be an improvement. Yeah that's the same. 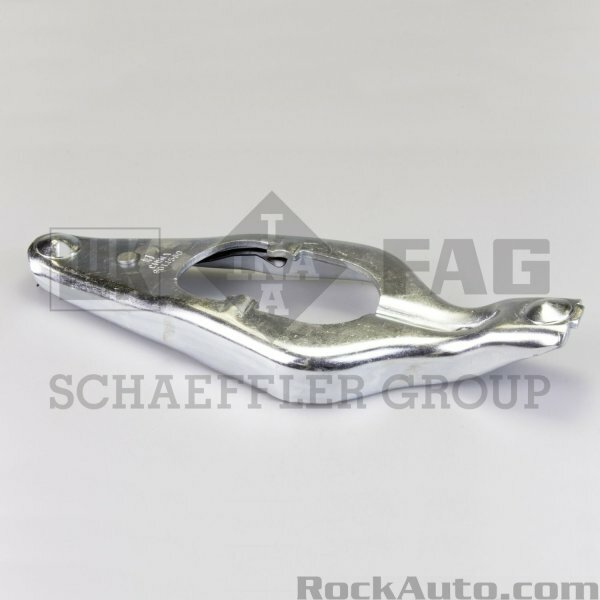 So here's the scoop on using the S-10 clutch fork, a photo link from Rockauto is below. As you can see it has a significant bend at one end. If you use it with a 10-1/2" pressure plate that end will hit the hat and you'll need a pedal stop, plus it will not give enough clearance to allow for clutch wear.